ONE new subscriber? Really? That’s it? Because after all those long hours of pouring your heart and soul into your writing…after doing everything you were told to do to get subscribers…well, you were expecting more. Maybe if I stare at it long enough, I can make it grow another digit or two through sheer willpower. Nope. It’s still the same measly old number. In fact, your list hasn’t grown much at all in the past week, or the past month. And it’s annoying as all heck. All this hard work, and what do I have to show for it? Know what? You aren’t alone in feeling this way. But all you need to grow your email list at hyper speed is to get the word out in an entirely different way…a way that most bloggers haven’t even considered. You may be thinking that nobody cares about you or that you’ll be old and gray before you have a sizable email list. You may even have grown to accept this as a fact of blogging. But you don’t have to be the norm. Watching your list grow doesn’t have to be like watching paint dry. Nothing’s wrong with you, and your people are definitely out there. All that you need is a shortcut…a faster way to get subscribers that you haven’t tried yet. It’s not writing epic posts, mastering SEO, or commenting on popular blogs. It’s not guest blogging, interviewing influential people, or reaching out to A-list bloggers. This method is actually so simple that it almost seems like cheating. I’m talking about buying subscribers. Wait-that sounds crazy! Isn’t that some sort of scam? Don’t worry; we’re not talking about buying a huge list of email addresses and spamming it with your blog posts. We’re talking about something far more respectable. Do you remember lemonade stands from when you were a kid? Well, if you ever had one, you’ll know that location is critical. For instance, which stand do you think would sell the most lemonade: the stand on a quiet cul-de-sac, or the stand in the busy part of town? Well, the lemonade stand in the busy part of town, of course! More people passing by means more potential customers. And it’s the same for blogging. If you expect to grow your email list simply by adding a sign-up page to your blog and hoping potential subscribers just happen to wander by, it’s like putting your lemonade stand in the middle of a cul-de-sac. Nobody really knows about your blog yet, so few people can find the way onto your email list. It’s frustrating, but the solution is simple. Set up your stand in the busy part of town. And these days, that’s Facebook. It’s where over 1.44 billion people hang out every month. So at least a small percentage of those people could be potential readers for your blog. What this means in practice is creating a Facebook ad that gets shown to potential subscribers and entices them to sign up to your email list. And the more ads you run, the more people will see your offer in their Facebook newsfeed, and the more new subscribers you’ll get. Many bloggers don’t even realize they can get subscribers by advertising their blogs on Facebook. They don’t think they should have to spend any money on getting subscribers – it should just happen organically. They think Facebook advertising is too difficult and takes too much time to learn. Ironically, most bloggers don’t have a problem spending on things like conversion-optimized WordPress themes when they started their blog and list-building plugins, but the idea of spending money directly to get subscribers seems crazy. So they just ignore it. But in fact, if you put any kind of reasonable dollar value on your time, it can be much more cost-effective to spend a little money. For example, let’s say you spend 10 hours writing a guest post (another popular option for building your list) that nets you 100 subscribers. Even if you figure your time is only worth $10/hour, you’re still effectively paying $1 per subscriber. True, Facebook advertising is complex, and it does take a long time to master. According to this report, I paid a grand total of $227.05 to get a whopping 532 new subscribers to my list in just 43 days. That means I spent an average of just 43 cents per subscriber! Not bad for a complete beginner, eh? But here’s the best part: I didn’t spend $227.05 all at once. On most days, my budget was only $5 per day. That’s the cost of one Venti Frappuccino at Starbucks. Are you ready to go to the busy part of town and get some subscribers? Read on. For your “lemonade stand” (your ad) to attract lots of subscribers, we’ve already established that you need to set up shop in a high-traffic area (Facebook). These days, your email address is like a currency; you don’t give your email address to just anyone without a good reason. So your incentive should be as appealing to your target audience as a cool glass of lemonade on a hot summer’s day. What keeps your ideal subscribers lying awake at night? Find a practical solution to that problem, and you have a “juicy” topic for your incentive. Next, you need to package that solution in the simplest form possible. You see, when surfing the net, people are in a mindset of avoiding work. And if people think your incentive will take a lot of their time and energy to consume, they’ll bail. So, instead of writing a 100-page e-book, type up a one-page PDF checklist of tools or resources (essentially, a downloadable list post). Instead of a lengthy video course, create a mini course consisting of short, actionable lessons delivered via an email autoresponder. Instead of a 30-day challenge, make it a 7-day challenge. If you can get your ideal subscriber one baby-step closer to solving that problem keeping them awake at night, you have a super “juicy” incentive for your Facebook ad. Once you’ve created your incentive, you’ll need a landing page with an opt-in form for people to subscribe to your list and get the incentive. Optionally, you may need some private pages on your website for delivering your incentive. WordPress Landing Pages is a free plugin that lets you create landing pages from the WordPress dashboard. The downside is, as with most free options, they only offer limited support. ConvertKit (from $29 per month) is an email marketing solution with a landing page builder, designed for professional bloggers. “Divi” from Elegant Themes (from $69 per year) is a drag-and-drop WordPress theme that can create attractive landing pages – and much more. LeadPages (from $300 per year) is the flagship option for creating landing pages. It’s robust and feature rich, and that’s reflected in the price tag. When choosing an image for your ad, you should pick a high-quality, professional-looking photo, right? Let’s get into the mindset of a potential subscriber for a moment: What is he on Facebook to do? Probably to see what his friends are up to. To look at photos from the latest get-together. To connect with family members from far away. He is definitely not surfing Facebook to read the ads. So if at the slightest glance your ad looks like an ad, he’ll ignore it. Your job is to make your ad look as much like the other familiar items in his newsfeed as possible. Because as he is scrolling down that list of items, he is making split-second decisions about what to pay attention to and what to skip over. And according to Dr. Robert Cialdini’s Principle of Liking, people have a tendency to say “yes” to those they like or are similar to themselves. So instead of using professional-looking stock photos, use a friendly photo of yourself. That way, your potential subscriber will see you as a regular person just like him, and he will be more likely to stop and engage with your ad. 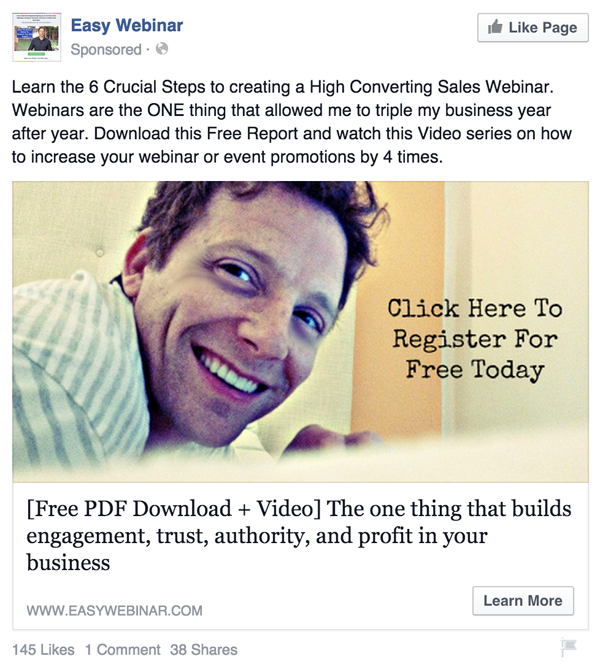 In this ad by Easy Webinar, the smiling photo of a “regular guy” takes advantage of the principle of liking. They also added a warm, grainy filter and framed the shot close to the subject. The resulting image looks a lot like a selfie taken with a smartphone, doesn’t it? This ad image by Luisa Zhou doesn’t even have any text on it: just a casual photo of the subject leaning toward the camera. This image says, comfortable, friendly, approachable. Bonus tip: If you do decide to use text over your photo, such as a short headline, just make sure it follows Facebook’s policies and takes up no more than 20% of the image. Use a free tool with a Facebook ad template, like Canva, to create your image. Then use the Facebook grid tool to make sure it complies with the text rule. If your image needs to be personable (not professional) to be engaging, your ad copy should be too. How do people talk to each other on Facebook? Do they use corporate speak? Big power words? Proper grammar? Talk to your potential subscriber like a friend. Get into their head, and use the words they use themselves. Make them feel that you understand them. Get intimate with your copy. So Instagram is all the rage. Forbes says so, Vogue says so, the numbers say so. But another platform to learn, really?! My photos are kinda blah. I’m not sure what to share. What do I post? Why isn’t my following growing after all this work? And how can I actually make money with Instagram anyway? Trust me love, I’ve been there! She took the questions keeping her audience awake a night, and echoed those same doubts and fears. Then she explains how she felt the same way (she’s another regular gal, “just like you”) and how her free Instagram class can answer those questions. It doesn’t take going to extremes to get a bod you really love. Facebook also suggests hooking the viewer with a question. Are you looking to grow your business with YouTube? 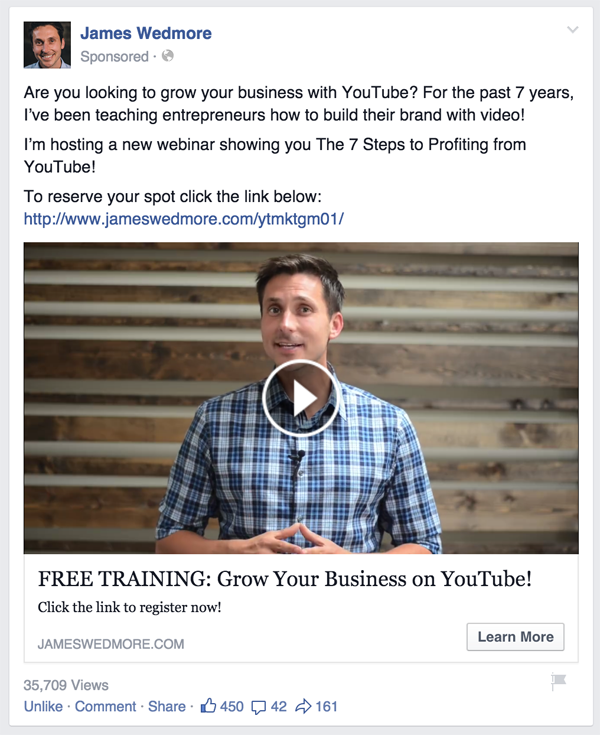 For the past 7 years, I’ve been teaching entrepreneurs how to build their brand with video! 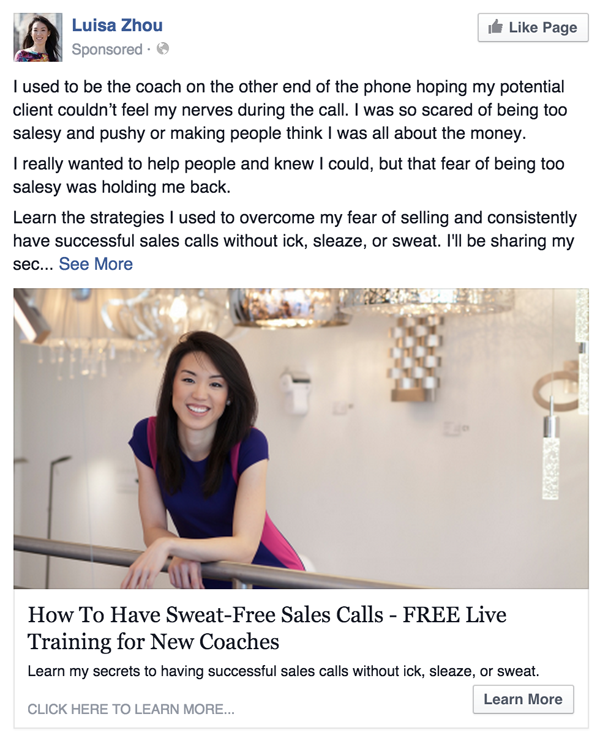 Bonus tip: Whenever you see a Facebook ad that draws you in, take a screenshot and put it in an inspiration file. Revisit this file whenever you get stuck writing your copy. Targeting is where you get to choose exactly who sees your ad. Because even the most attractive ad won’t get results if it goes out to the wrong people. It’s a bit like setting up a lemonade stand outside of a diabetic clinic. It may be in a high-traffic area, but unless your lemonade is sugar-free, those people are probably not right for your offer. Where are my ideal subscribers hanging out on Facebook? For the ad campaign I mentioned earlier (the one that got me 532 subscribers in 44 days), my incentive was a seven-day prenatal fitness challenge. So my ideal subscribers were pregnant women wanting to stay fit. Facebook allows you to target women or men, so that part is simple. But how do you target pregnant women? Well, on Facebook, pregnant women tend to “like” pages about pregnancy. Thankfully, Facebook offers a targeting option for that. 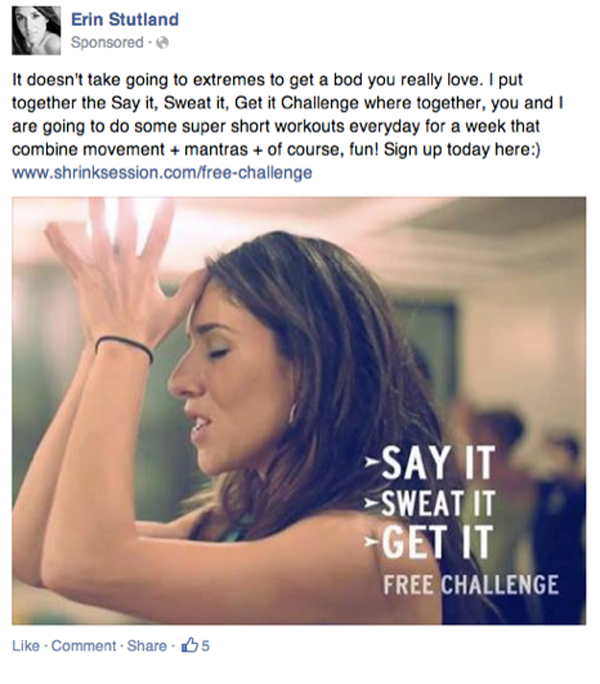 Taking it one step further, you can also target women who “like” pages related to fitness. Confirm that each of the pages you choose has a healthy amount of likes (at least a few thousand likes per page). Choose the top-three pages from your list to target. Once you have a short list of target pages, your goal is to display your ad to as many people who like those pages as possible, while keeping your costs low. You have your irresistible offer, your engaging image, and intimate copy, and you’ve figured out where your ideal subscribers are hanging out on Facebook. Now it’s time to pull it all together and run your ads. The trick to getting the most subscribers from your ads, as quickly as possible, and at the cheapest price, is to use something called conversion tracking. Conversion tracking allows you to keep track of how many people see your ad, how many people click on your ad, and how many people actually take your desired action (in this case, entering their email and subscribing to your list). This way, you will have a detailed report of how much money you spent per conversion (i.e., per new subscriber). You can use this information to get the biggest bang for your buck: the most subscribers in the least amount of time. This next part is a little technical, but don’t worry…it’s not as scary as it sounds. To track your conversions (i.e., how much you’re spending per subscriber), you will need to grab a piece of code that Facebook gives you (called a tracking pixel) and place it between the <head> and </head> tags on the “thank you” page you made earlier (the page that shows up right after someone opts in to your email list). To make it much easier for you, I have recorded a video walkthrough of all the steps to place the tracking pixel and run your Facebook ads. When you set your budget (as shown in the video walkthrough above), Rick Mulready recommends starting with a small budget (I use a $5 daily budget). If you want to spend more money, increase your budget in small increments until you reach your desired budget. This strategy seems to push Facebook to find you inexpensive subscribers, and it gets your campaign off to a good start. Now that your ads are up and running, you will probably be tempted to check them every 2 seconds to see how they’re doing. But that’s the last thing you should do. Wait at least 48 hours before making judgments. If after 48 hours your cost per conversion (cost per new subscriber in our case) is $4 or less, your campaign is off to a good start. Keep in mind, to get your cost as low as possible, it is not at all uncommon to have to refine your incentive, your ad, or your targeting. Your cost also depends on how relevant your incentive is to your selected audience, and it’s not always what you might think. 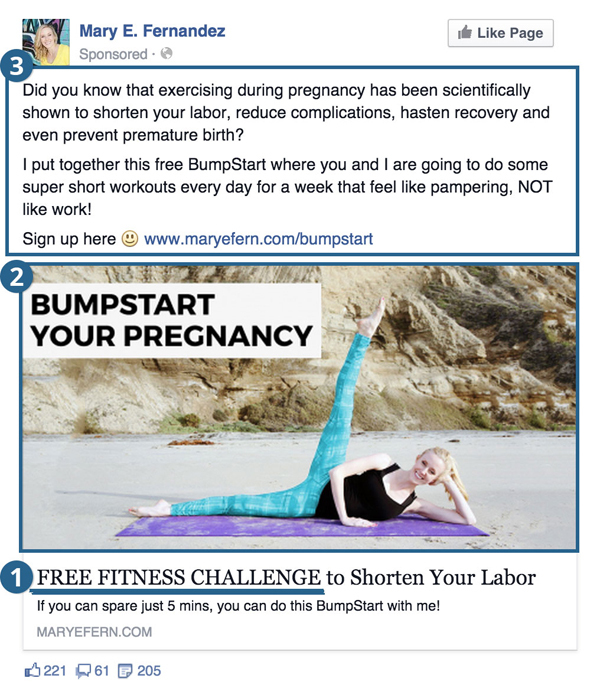 For example, the first incentive I used for my ads was a PDF checklist entitled, The 8 Exercises Every Pregnant Woman Should Avoid. I thought that incentive was quite relevant for my audience, but my cost per conversion went much lower when I switched to offering a free fitness challenge to the same audience. If after 48 hours your cost per conversion is $4 or more, stop running the ad. Then, come up with a hypothesis for what went wrong. 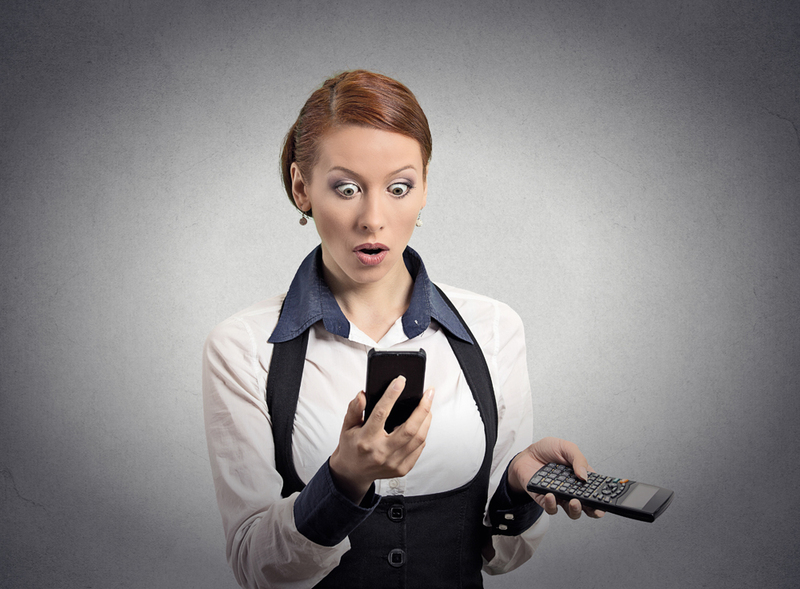 Is the problem your targeting, incentive, image, or copy? Maybe it’s your landing page that isn’t converting well? What can you change to get better results? If you have more money to spend, try split testing with another ad to see what works best. But if you can only spend $5 per day, just make one tweak and then run your ad for another 48 hours. The key is to think of all of this as an experiment. Test different theories like a scientist, and be patient! Once you learn what works, you can repeat it and reap the rewards again and again. Facebook advertisers are reporting that video ads are working wonderfully for them, they’re significantly more effective, and they’re getting conversions at a mere fraction of the price of static image ads. For example, Derek Halpern created this epic video ad that landed him over twenty-six thousand views so far! To make a video ad, follow the steps above, and simply upload a video instead of an image. Clearly state your call to action (“All you have to do to gain access is enter your name and email and press, Get Instant Access.” 1:06). The maximum length for Facebook video ads is 45 mins. Different opinions abound about what length works best, but Facebook says to worry less about length and focus more on storytelling. But this time, instead of one subscriber, you got 10 subscribers overnight and even potential affiliates for your side gig. Now imagine that happening again tomorrow, and the next day, and the next. All without any additional effort from you. That’s what growing your blog on autopilot looks like. Instead of worrying about getting subscribers, you can focus on what you love most: blogging. Because if you’re serious about building your blog, but your time is too valuable to waste, spending a little money could be a brilliant move. Well, you could spend $10 and not get any new subscribers. But the more likely scenario? You unlock a way to grow your list faster and more reliably than you ever thought possible. So can you truly afford not to give it a try? About the Author: Mary Fernandez is a self-proclaimed “blogoholic”, on a mission to help other bloggers stop twiddling their thumbs and start getting measurable results. For more information on the strategy outlined by this post, watch her tutorial: Setting Up Your Facebook Ads for Mammoth List Growth with Minimal Cost.